Easy Chicken Enchilada Casserole | Low Carb! We've had several requests to do casserole recipes, so we dug deep into our spicy souls for this Easy Chicken Enchilada Casserole. It's creamy, filled with shredded chicken and a wave of spice in every bite. You can top it over cauliflower rice or eat it right out of the skillet. Trust me when I say, there is no wrong way to eat this delicious dish. You may know enchilada casseroles as being on the higher carb end due to added tortillas into the casserole, but we left those out and you won't even miss them. Our love for spice and Mexican food doesn't start and stop with this casserole recipe. Try any of the following Mexican inspired keto dishes. One of our favorite recipes to meal prep is our Mexican Shredded Chicken. If you're a lover of spice and flavor, we highly suggest you make our Mexican shredded chicken recipe for you family and friends! I am a huge sucker for casseroles in all forms, no matter the meat or mix-ins! Matt and I are complete opposites in this way because he prefers all his foods to be separated, so he can eat them one at a time. However, he was even a fan of this recipe. What's not to love when you combine spices, veggies, meat and sour cream?! If you've got a family to feed or even have a love for casseroles like I do, I highly recommend you make this easy Chicken Enchilada Casserole. Tip: You can use boneless, skinless chicken thighs for a fattier meat and a higher fat to protein macro ratio! 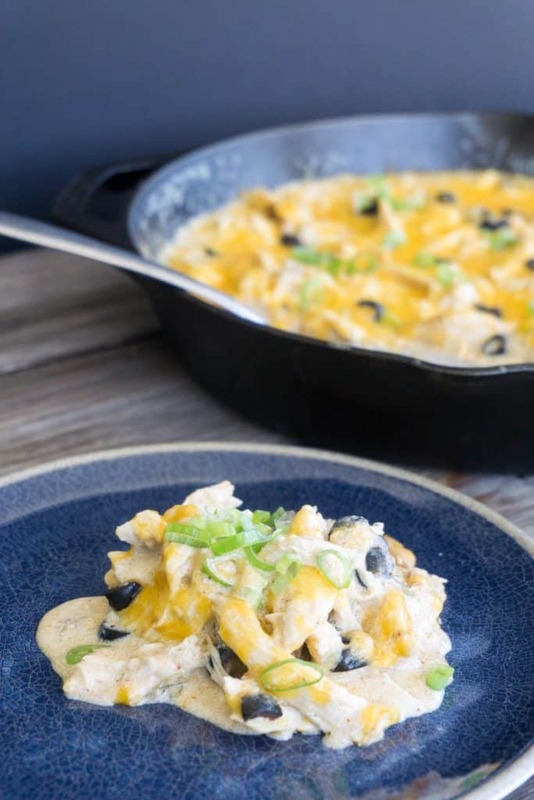 Recipe can be quickly added to MyFitnessPal - Search "KetoConnect - Easy Chicken Enchilada Casserole"
Add butter to medium heat skillet and allow it to melt. Once melted stir in the xanthan gum and allow to thicken slightly. Pour in the chicken broth and whisk through the butter and xanthan gum. After a couple minutes, add the chilis, olive and spices and combine well with a whisk. Place the chicken into the skillet and bring to a boil (a couple minutes). Turn the heat down to a simmer and place a lid on the skillet. Allow the chicken to cook for 20 minutes (until fully cooked through). After 20 minutes, remove the chicken to a plate and shred into preferred size chunks with two forks. You can also just cut it into bite sized pieces. Add the sour cream to the skillet and mix throughly combining all the spices, chilis, olives and sour cream. Taste test and add whatever additional spices you may want. if you prefer more spice increase the chili powder. Place the shredded chicken back into the skillet and combine. Top the entire recipe with cheddar cheese and place in a 350 degree oven for 10 minutes or place a lid on the skillet until the cheese has full melted. Serve immediately with our low carb tortillas, over cauliflower rice or on its own and enjoy! This recipe can be stored in a sealable container in the fridge up to 2 weeks or frozen up to 2 months. TIP: This recipe yields six portions. We recommend portioning it out prior to serving to ensure you get the correct macros per serving.